Horsemen were greeted with a very wet track at Shelbyville Tuesday, July 31, but thanks to an all-weather surface, racing moved on as scheduled giving driver Mike Hollenback his 400th career win during the program. Also, both Don Eash and Doug Rideout recorded driving and training doubles on the eight-race card. The late morning event saw the quickest mile of the week by three-year-old pacing standout Miss U Big Mike, who scored his gate to wire performance in 1:58.0. 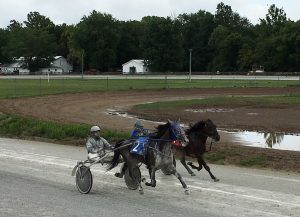 Mike Hollenback rolls to his 400th career win behind Chuckie Me in a division of the three-year-old filly trot Tuesday, July 31 at the Shelby County Fairgrounds. Three-year-olds made up the afternoon racing program and due to standing water in places on the track, starter Mike Moss only utilized four horses on the gate rather than five, placing the remainder of the fields on the second tier. The third race of the afternoon saw a big matchup between Miss U Big Mike and King Lil Joe. Driven by Mike Peterson, Miss U Big Mike roared out at the start and never looked back, keeping open lengths between him and his rival King Lil Joe the entire mile, establishing fractions of :28.3, :58.3 and 1:28.4 before pouring it on around the turn and busting home for the four and three-quarter length win in 1:58.0, a final panel in :29.3. King Lil Joe was solid for second with Jay Cross in the bike followed by Hilltop Ginger and Alex Udell for third. It was the fourth win of the season for Miss U Big Mike, who is named after Irwin Kaplan’s friend, Mike, who passed away. Kaplan, who is the corresponding officer of Charlie K Racing, owns part of Miss U Big Mike with Funk Racing Stable. Larry King trains the gelded son of He’s Gorgeous, who now has 11 career wins and in excess of $33,000 in purse earnings, a majority of which has been earned on the Indiana county fair circuit. 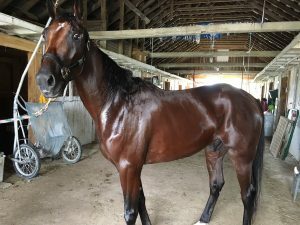 Miss U Big Mike, trained by Larry King, returns to his stall following his new lifetime mark of 1:58.0 at the Shelby County Fairgrounds Tuesday, July 31. In the very next race, Mike Hollenback scored a memorable win of his own behind Chuckie Me in a division of the three-year-old filly trot. Sitting patiently behind Mamie’s Power and Mike Myers, Chuckie Me moved out in the lane and trotted home for the win in 2:06.1. Mamie’s Power was a comfortable second over College Krystal and Odell Cross for third. Chuckie Me is owned and trained by Mike Hollenback. It was the third win in 11 starts this season for the Pilgrims Chuckie filly. Hollenback, a native of Anderson, Ind., first started driving in 1997. He won his first race at Converse behind Toby’s Boomtown for trainer Modie Beeman, who helped Hollenback get started in harness racing. 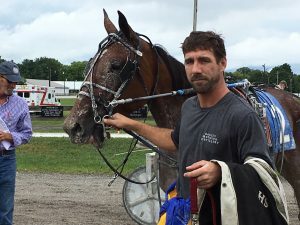 The 40-year-old has gone on to train and drive several of the state’s top younger contenders each season and has accumulated more than $1 million in earnings as both a trainer and driver. Don Eash cleared the top spot with Go Gabby Go in the final turn, trotting home for the win in a division of the three-year-old trotting fillies Tuesday, July 31. Eash had a strong contender in the second division of the three-year-old trotting fillies as Go Gabby Go moved out in the final turn and rallied home a winner by two and one-half lengths in 2:04.0. Also trained and owned by Eash, the Mr Cantab filly now has five wins for the year and was the first of two wins for Eash on the card. Eash also drove Megaglide to victory in a division of the three-year-old colt and gelding trot, scoring the win by a neck over J S Peyton and Alex Udell in 2:03.3. Sweet Swan of All and Lester Raber made it a three-way photo finish for third. Striking Encore was impressive once again in a division of the three-year-old filly trot, scoring a gate to wire win in 2:05.4 for Rideout. The Encore Encore filly won by three and one-quarter lengths over Woodside Bambi and Eash. Mervin Eicher owns Striking Encore, who now has nine wins in 2018. 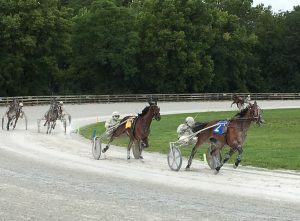 Brad Ferguson leads Go Gabby Go to the test barn following her win at the Shelby County Fairgrounds Tuesday, July 31. Rideout also connected for a win in the final race of the day, a division of the three-year-old colt and gelding trot. In the same fashion as Striking Encore, Power Tower went straight to the lead and never looked back, fending off a late charge by Mr Quaker and Walter Haynes Jr. to win by a neck in 2:06.0. It was the Power Play’s fourth win of the year after being unraced at two by Glider Stables of New Haven, Ind. The Indiana Sired Fair Circuit will make its next stop at Portland Saturday, Aug. 4 followed by two days of racing at the Indiana State Fair Wednesday, Aug. 8 and Thursday, Aug. 9. The Fox Stakes will be featured on Wednesday with Indiana Sired Fair Circuit championships held during the second program on Thursday. Earlier on Thursday, the consolation finals will be held for the Indiana Sired Fair Circuit contenders.